The 2015 fiscal year ends on September 30, 2015 and we do not yet have a 2016 budget, a transportation bill, nor a resolution to Veterans Administration shortfalls which may shutter a number of VA hospitals. And if that isn’t enough on their plates to handle when they only plan to actually work 16 days between now and then, they also need to resolve their issues with the Iran Nuclear Deal. AND … there are no plans to cancel their August recess. Last week, the United States along with France, Germany, the United Kingdom, Russia, and China signed a deal with Iran to substantially limit Iran’s nuclear program in exchange for the removal of international sanctions. Congress must now review the deal—and decide whether to pass a resolution to disapprove the agreement. The entire process could take up to 82 days, and during that time, the President cannot lift sanctions on Iran until the review and voting period is over. The law also requires the Administration to provide detailed reports to Congress every 90 days to ensure that Iran is complying with the nuclear agreement. Here’s how that review process should work, according to legislation passed by Congress and signed by the President in May: The White House delivered the agreement to Congress on Monday—five days after the signing of the Iran deal. Now, Congress has 60 days to review it, or until mid-September. (Keep in mind that Congress will be in recess from August 10 – Sept. 7.) Congress then has 12 days (by the end of September) to vote on a joint resolution approving or disapproving the deal. Or Congress could opt to do nothing. Worth Noting: Two Representatives from Nevada Mark Amodei and Joe Heck have signed on a co-sponsors of this resolution of disapproval. The House has been working on appropriations bills for FY 2016. Thus far, they’ve passed Commerce, Justice and Science (HR 2578); Defense (HR 2685); Energy and Water (HR 2028); Legislative (HR 2250); Military and Veterans (HR 2029); and Transportation and HUD (HR 2577) appropriations bills. But when they got to the Interior and Environment Appropriations Bill (HR 2822) last week, they had to pull it from the floor after a series of amendments were introduced regarding whether the Confederate battle flag should be displayed on public lands. Three amendments, introduced by Democrats, had been passed on July 7th that would block the National Park Service from allowing private groups to decorate graves with Confederate flags specifically in cemeteries in Georgia and Mississippi and would bar the Park Service doing business with gift shops that sell Confederate flag merchandise. Unhappy with those passed amendments, a Republican sponsored amendment was introduced essentially nullifying the passed amendments. To keep from seeing everything degenerate into a total brouhaha over the Confederate Flag, Speaker Boehner pulled the bill from the floor. Senate Democrats have blocked consideration of appropriations bills until a new budget agreement is negotiated that will mitigate the sequestration budget cuts since 2013. Congress aims to complete the appropriations process by the end of the fiscal year, September 30. If they don’t, then they’ll need to pass a short-term Continuing Resolution to prevent yet another government shutdown. Meanwhile, the Veterans Administration has put Congress on notice that they have a $2.5B shortfall that if not resolved will force them to start closing some VA hospitals beginning in as early as August. Both the Highway Account and the Mass Transit Account of the Highway Trust Fund are nearing insolvency, according to the Department of Transportation. 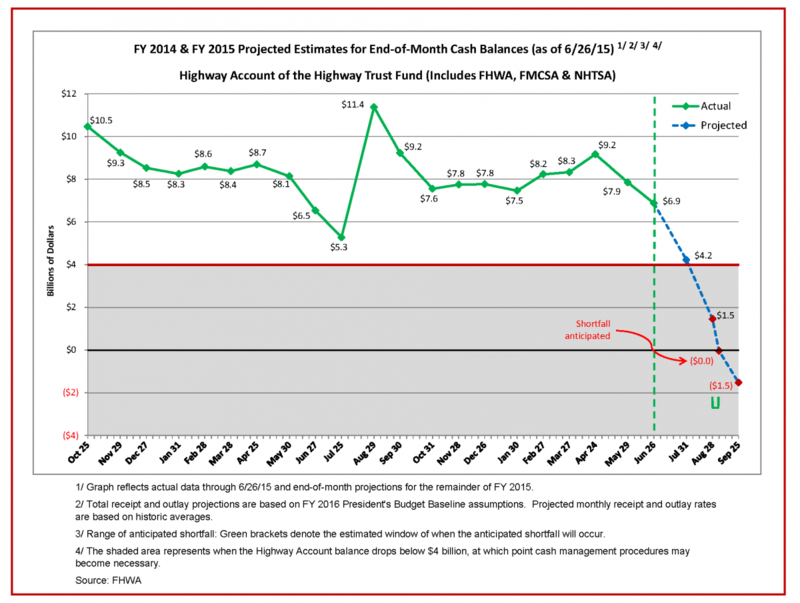 With a shortfall in the Highway Trust Fund approaching, cash management steps are not far away. Because the HTF supports critical roadwork by State DOTs, these cash management procedures will slow improvements and basic repairs on roads across the U.S. With the Highway Trust Fund authorization set to expire on July 31, the House did pass an extension through December 18. You’re going to love this. The claim is that the extension would provide $8 billion in new money – $5 billion from tax compliance measures, and $3 billion in reduced spending. But true to form, it includes no new revenues, and is partly funded by a two-year extension of fees that would have sunsetted (passenger airport security fees collected by the TSA). GROW America Act (Generating Renewal, Opportunity, and Work with Accelerated Mobility, Efficiency, and Rebuilding of Infrastructure and Communities throughout America Act) [HR2410] sponsored by Rep. Peter DeFazio (D-OR). This is the Administration’s long-term surface transportation reauthorization bill. Provides a total of $478 billion over six years, a 45 percent increase for highways, bridges, public transportation, highway safety, and rail programs. The DRIVE Act (Developing a Reliable and innovative Vision for the Economy Act) [S1647] sponsored by Sen. Jim Inhofe (R-OK). It’s a 6-yr surface transportation reauthorization bill sporting a “new” freight program to prioritize federal spending. NOTE: The bill, purported by some to have been written by Monsanto, prohibits States from enforcing any bills addressing GMOs that exceed the requirements of HR1599 effectively nullifying existing legislation in a number of states (Maine, Connecticut and Vermont, where foods containing GMOs are required to be labeled). 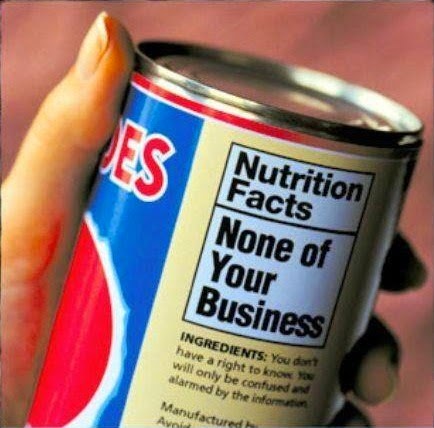 If passed, the FDA would be the sole authority to require GMO labeling. The House has scheduled a vote on HR1734, a bill that would set rules governing the management and disposal of coal ash. Sponsor: Rep. David McKinley (R-WV) According to the House Majority Leader, this bill will “provide job-creators, and over 300,000 workers, with certainty by putting states in charge of the enforcement to implement the standards set by EPA regarding the safe disposal of coal ash,” It would authorize States to set up permit programs for coal ash, as well as allow the EPA to offer permits in States that don’t establish their own permit programs. That is a seriously overloaded plate and with only 16 legislative days left in this fiscal year, that doesn’t appear to be near enough time for this unproductive Congress to resolve those issues. 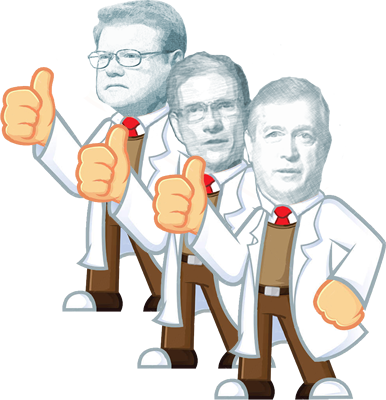 The Supreme Court has ruled that Obamacare is constitutional, but yet again, Republican Congressmen Joe Heck and Mark Amodei refused to move on and told American families in Nevada to drop dead when they voted to take away their health care. Congressman and Medical Doctor Joe Heck, and Congressman Mark Amodei voted to again let insurance companies deny families care because of preexisting conditions. They voted to throw millions of senior citizens back into the prescription drug donut hole. Both Nevada House Republicans voted to kick millions of young adults off their parents insurance. And just in case that heartless vote wasn’t bad enough, these are the same Congressmen who support the Romney/Ryan budget that ends Medicare while giving huge tax cuts to millionaires, big oil companies and corporate jet owners.